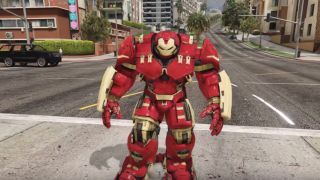 GTA 5 already has its fair share of incredible mods, but the new Hulkbuster mod might be our favourite one so far. The mod recreates Iron Man's special armour from the comic books (most recently seen in Avengers: Age of Ultron) and lets you unleash total carnage on Los Santos, chucking cars, taking down police helicopters, and just generally being a nuisance. If you want to try it for yourself, you can download the PC mod here. You can also see it in action below.